The awesomely good treats from No Whey! Foods are also available in fun miniature cup size! Remember the days when chocolates were full of milk derivatives, all sorts of nut and gluten ingredients, and food allergens questionable to many? Well, now you can enjoy fabulous and safe milk-style chocolate filled with peanut-free sunflower butter that makes these safe for those with peanut allergies. They’re also 100% dairy-free and are also free of gluten as well – you’ll have a new way to indulge in your favorite treats from the past, and you’ll never miss those old peanut butter cups again! 1.4 oz. 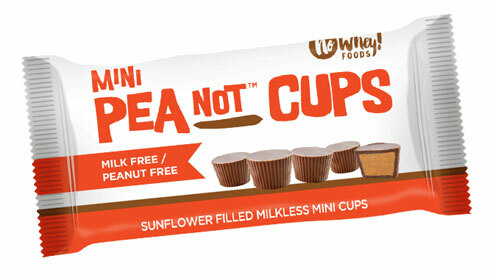 (40g) package contains around 11 Mini PeaNot Butter Cups. $2.49 per package.